I can imagine one question runs through any persons mind once the decision is made to start a blog: “What do I say in my first blog post?” My goal for this blog is to talk about the use of GIS in urban and regional planning. I do not want to make it a personal/family blog, but a more personal and timely version of my business’s website. 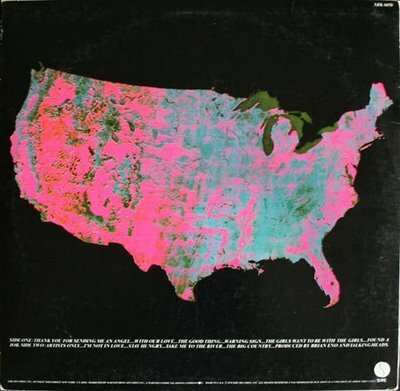 The back cover is a reproduction of Portrait U.S.A., the first color photomosaic of the United States. It is made up of 569 photos taken from space by the LandSAT satellite. Each photo in the mosaic is made up of four separate photos of different parts of the light spectrum: Green, Red, and two different Infra-red regions. These light regions were chosen because they help bring out the differences in geographical forms and types of vegetation. Each image is made up of many scan lines, much like a T.V. picture… analog information is converted to digital information and then transmitted to various ground receiving stations. This information is then converted into a black-and-white picture corresponding to each spectral region. These can then be combined to make the color pictures that are used in this mosaic. In the version reproduced on the cover, the information from the green spectral region is printed as yellow, the red region is printed as magenta, and the infra-red region is printed as cyan. This is called a false color image. In this version vegetation appears as turquoise, rocks and soil appear as red, yellow, brown, and towns, roads, and water appear as black. Objects as small as 33 feet are visible on the LandSAT photos if the object is in contrast to its environment. The practical applications of the LandSAT photos are many, some of which are forest-fire damage, regional planning, assessment of land use: Which crops are being grown where, mapping of ice for shipping, mapping and detection of air and water pollution, and monitoring surface mining. Portrait U.S.A. is copyrighted by the General Electric Co., 1976. It was produced by their Beltsville Photo Engineering Lab with the assistance of the National Geographic Society and the National Aeronautics and Space Administration. Of course great album cover art was never the sole focus of any band. The music mattered, too. And it was one of the songs on this album that really drove home, for me anyway, the importance of planning, and how it affects our everyday lives. 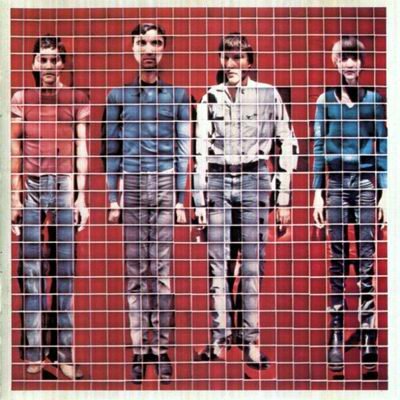 It was overshadowed by the much more popular Take Me To The River (written by Al Green), but The Big Country (by David Byrne), was a much better song, fit the title of the album and the cover art, and as the final track, completed the entire album experience. Many times, after sitting through a 2 hour meeting, presenting the results of a survey, a workshop meeting, a buildout analysis, or some other GIS analysis, I queue up this song, turn the iPod up to max, and settle in for the long drive home. The lyrics are not a very positive commentary on our built environment, actually, the opposite. The song essentially asks the question “Why would anybody want to live the way we do?” I ask myself that same question all the time. What is it that keeps our elected officials from building places we would all love to live in? I don’t have the answer to that question, but for some reason, I get great satisfaction from the fact that one of my favorite bands asked the same thing, over 31 years ago, before I even knew what urban and regional planning was. This entry was posted in GIS, Planning and tagged Talking Heads on June 27, 2009 by Don.